Bangkok Sightseeing Tour Bangkok is one of Asia's most cosmopolitan cities. Created as the Thai capital in 1782 by the first monarch of the present Chakri dynasty, Bangkok is a national treasure house and Thailand's spiritual, cultural, political, commercial, educational and diplomatic centre. Major tourist attractions include glittering Buddhist temples, palaces, timeless Venice of the East canal and river scenes, classical dance extravaganzas, and numerous shopping centres. Siam P.D. Tour offer Half Day Tour, Full Day Tour, Night Tour which can be tailored to suit your needs which are bookable prior to your arrival in Thailand. Visit Royal Grand Palace Emerald Buddha Temple Wat Prakeaw Chakri Tron Hall Half Day Tour. Start the tour at 08.00 AM and 01.00 PM 3-4 hours touring time. Visit Golden Buddha( 5.5 Tons Solid Gold Buddha), Wat Pho ,Reclining Buddha , Marble Temple (The Temple of King Rama 5). Half Day Tour. Visit Temple of Dawn, Royal Barge Museum Bangkok Noi Canal With Long Tail Speed Boat. Half Day Tour. Visit Royal Grand Palace Emerald Buddha Temple Temple of Dawn, Royal Barge Museum Klong Bangkok Noi With Long Tail Speed Boat. Half Day Tour. Start the tour at 08.00 AM and 01.00 PM 4-5 hours touring time. 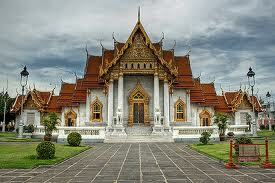 Visit Temple of Dawn, Royal Barge Museum With Long Tail Speed Boat Ans Flower Market. Visit Royal Grand Palace and Emerald Buddha Temple and Visit Temple of Dawn, Royal Barge Museum With Long Tail Speed Boat. Visit Royal Grand Palace and Emerald Buddha Temple and Visit Golden Buddha, Reclining Buddha and Marble Temple . Visit Jim Thomson' s house and Vimarnmek Museum Golden Teak Wood Mansion. Half Day Tour. Start the tour at 08.00 AM and 01.00 PM 3-4 hours touring time. Visit Mon Village L:ocal Thai's Life Pottery Village. Half Day Tour. Start the tour at 08.30 AM , 5-6 hours touring time. Visit Royal Grand Palace Emerald Buddha Temple Wat Prakeaw Chakri Tron Hall Vimarnmek Museum Golden Teak Wood Mansion..
Half Day Tour. Start the tour at 08.00 AM and 01.00 PM ,4-5 hours touring time. Visit Thai's Village and Thai's Life and Take Long tail speed Boat True to The Main market. Half Day Tour. Start the tour at 07.00 , 6-7 hours touring time. Full Day Tour. Start the tour at 07.00 - 16.00. Visit Bridge over river Kwai, JETH War Museum and cemetary. (Lunch include). Full Day Tour. Start the tour at 08.00 and 13.00 3-4 hours touring time. Drive to Pattaya with boat trip to coral Island seafood Lunch included. Enjoy the unique and unforgettable experience of the world-renowned Thai Village Cultural Show, featuring an impressive cast of 150 performers, portrays captivating scenes of everyday life in rural Thailand. After Noon Tour. Start the tour at 12.00 4-5 hours touring time. Visit the Sampran Crocodile Farm to see the Crocodile Wrestling and Greatest Elephant Show After Noon Tour. Start the tour at 10.30 4-5 hours touring time. Enjoy the unique and unforgettable experience of the world-renowned Thai Village Cultural Show, featuring an impressive cast of 150 performers, portrays captivating scenes of everyday life in rural Thailand.Visit the Sampran Crocodile Farm to see the Crocodile Wrestling and Greatest Elephant Show After Noon Tour. Start the tour at 10.30 AM 4-5 hours touring time. Thailand's greatest open zoo and leisure park that offers a great variety of entertainment for everyone. Whether it is an exciting safari drive through the picturesque African wilderness settings, an intimate encounter with our friendly dolphins or an exhilarating fast-paced action stunt spectacular, Safari World.Lunch include Full Day Tour. A large scale amusement park within its beautifully decorated area, there are linked paths, pools, legendary castles and many funny toys and exciting playing machines Lunch include. Full Day Tour. Start Rate : 1,500 THB More info.. Throughout the cruise, an expert guide explains the historic background and legends of the attractions to you, assuring a priceless trip. The visit of carefully chosen ancient attractions gives a comparative study of the past with the harmony of the natural beauty along the river. Start the tour at 08.00 and 13.00 3-4 hours touring time. Noong Nuch Tropical Garden Beautiful recreational park in typical Thai settings, dotted with colorful flowers and plants. and Long Neck Karian village. (Lunch Include)Full Day Tour. The Calypso Cabaret offers you an evening of laughter, dazzling lights, beautiful 'women' and a lot of funs. Each night more than 50 performers will amaze you with a spectacle that would not be out of place any where in the world. Night Tour. Time for your dinner under the candle light with " Live Music" in a romantic atmoaphere. Serving a delecious Thai & International cuisine with a modern classic Thai style.Half Day Tour. Start the tour at 06.00 PM 3-4 hours touring time.